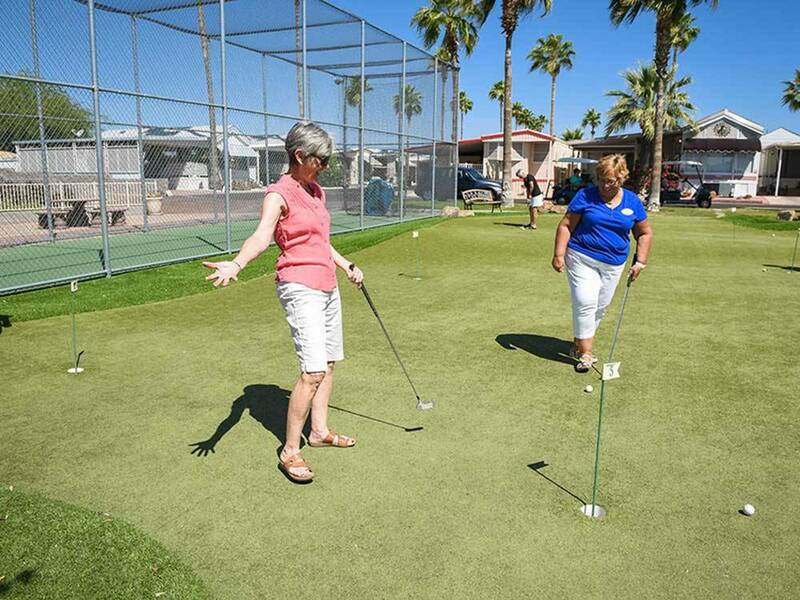 Guests enjoy a wide range of activities-fun dancing events-great pool-a game under lighted tennis/shuffleboard courts-shopping-restaurants and a short distance to fabulous golf courses. A new dog park for your pet! We spent a month in the Phoenix area to enjoy spring training. We stayed at The Good Life for that month and enjoyed our stay. They are filled with mostly park models, but do have 10-20% of their spaces open for the RVers. The park has good amenities including two nice pools and hot tubs, computer lab, work shops, ball rooms, work out room ,etc. The big downside for us was the lack of a working wifi. The turn into the resort and the turns throughout the resort are tight. It doesn't help that they have parking on one side of the road. When we checked in, we were given a 24-page rule/regulation book. We were also given a nametag that we had to keep pinned to our shirt whenever we were in the park. I wasn't too happy about that. I don't like putting holes in my clothes. The site tilts towards the street, so we had to use leveling blocks under our front wheels. We had problems with our water and electric, and found out later that several people have the same problems. When we tried to hook up the utilities, the electric didn't work. We called the office. By the time someone came to help, my husband had played around with it and had gotten it working. Two days later, the electricity went out again. This time my husband couldn't get it working. We had someone from maintenance come out, and he managed to get it on. A couple of days later, we had no water. Three phone calls and almost an hour and a half later, the manager came to look at it. He had no tools. We had to hook up our water hose to the neighbor's pedestal. The next day they got our water going. During the two months we were there, we had a few more power outages and more problems with the water. The office closes at 4 pm. If you have a problem after that, you have to call the guardshack. There's not much they can do since the maintenance men are not on duty, and the manager doesn't have any tools. Needless to say, we will not return to this park.